Everything comes to an end, and our sun is no exception. A star happily cooking along in its middle age, Sol has many millions of good years ahead of it — but its eventual doom is certain. Here's what that will look like. Click to enlarge the illustrations below. About 1.1 billion years from now the sun will begin to grow larger and hotter. The earth's ice caps will melt and, as the planet grows hotter, the oceans will boil away. Eventually Earth will lose all its water to space. It will be a hot, dry planet. 3.5 billion years from now, as the sun steadily grows larger and hotter, a now-lifeless earth will resemble the inferno of today's Venus. 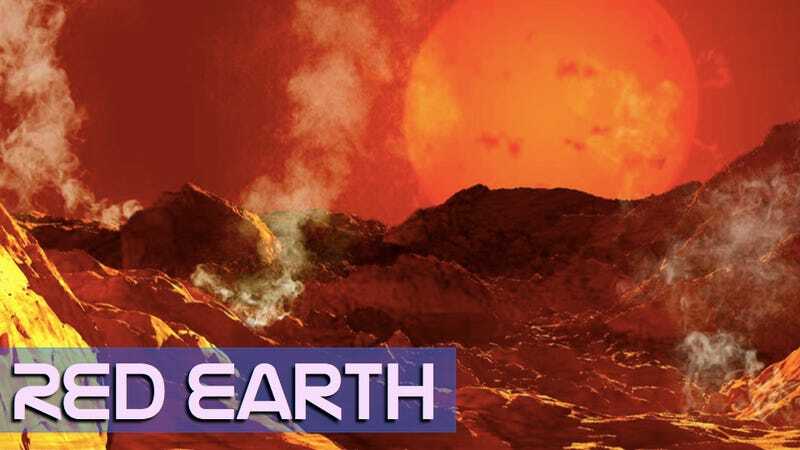 As the ever-growing sun becomes a huge orange giant star, dominating the sky, the surface of Earth will glow with a red heat and mountains will begin to melt. A bloated red giant sun will engulf the orbits of Mercury and Venus. Its tenuous outer atmosphere may even reach the orbit of the earth. Here we see such a sun from the surface of Europa. Its miles-thick crust of ice is thawing under the warmth of a sun more than twenty times larger than the one we'd been used to seeing in earth's sky. Even frigid Pluto now basks under the glow of a sun that had once been a heatless pinpoint and now appears four times larger than the sun once did in Earth's sky. Roughly 12.4 billion years from now, the sun has blown off its outer layers. A shimmering planetary nebula now expands like a soap bubble around the tiny remnant of the sun's core, seen here from a distant Kuiper Belt Object. All that is now left of our star is a white-hot dwarf probably not much larger than the planet Earth had been. It is seen here from the burned-out, lifeless cinder that is the corpse of our world. But the solar system hasn't seen the last of its abuse. The Milky Way and Andromeda galaxies are rushing toward one another on a collision course. As they pass through one another and their spiral arms unwind and the galaxies are distorted beyond recognition, the dwarf sun and its transformed planets may be flung bodily into intergalactic space. At least the view looking back will be spectacular. Eventually, even the universe itself will come to an end, as all of the energy in the universe is used up. Everything will be at the same temperature and chemical reactions will cease. No work can be done. No information will flow. Even intelligence, thought and imagination will stop. Nothing will ever change. By then, perhaps 1000 billion years in the future, there will be nothing left of the universe but darkness, emptiness and absolute cold. Ron Miller is a science artist. Visit his website here.